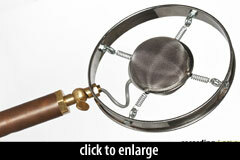 The Louise is a medium diaphragm (21mm) condenser microphone intendeded for live vocal and ensemble use. 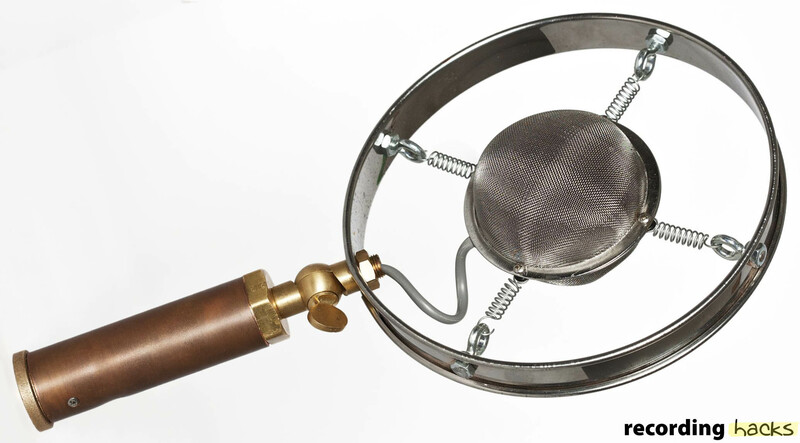 The design features a spherical stainless steel mesh (“tea ball”) headbasket, spring-mounted within a large chrome ring. The sculptural design is reminiscent of early broadcast microphones, and is made largely from standard hardware elements. A swivel mount below the large suspension ring allows the capsule head to be tipped forward or back relative to the microphone’s body, facilitating positioning. The headbasket uses silk and foam for blast filtering, and Sorbothane for shock and vibration damping to minimize handling noise. The capsule is an electret condenser (model TSB-2555), with additional acoustic damping. The capsule uses a 21mm diaphragm on a 26mm assembly. Capsules are individually tested and selected; roughly 30% of capsules are rejected for not meeting design criteria. The impedance conversion circuit is a transformerless FET design, built with high-grade components including metal film resistors, polypropylene and polystyrene capacitors, and individually tested, hand-matched and biased transistors and JFETs. The circuit includes moderate bass rolloff to compensate for proximity effect, and high frequency EQ to avoid harshness and help control feedback.